A Chilean bishop has acknowledged the damage inflicted on survivors of clerical sexual abuse and the mishandling of cases by church leaders in the country. Source: CNS. 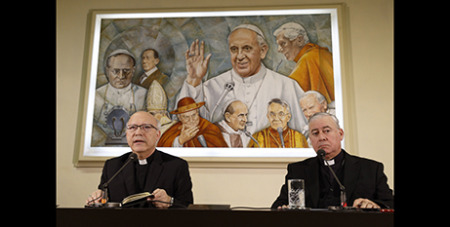 Bishop Gonzalez, along with Auxiliary Bishop Fernando Ramos Perez of Santiago, met with journalists on Monday, on the eve of a three-day meeting between Pope Francis and 34 Chilean bishops. The bishops are meeting at the Vatican until Thursday to discuss with Pope Francis their handling of clerical sexual abuse allegations. Echoing Pope Francis’ April 11 letter to the Chilean bishops, Bishop Ramos told journalists that the bishops felt “pain and shame” for the abuses committed. At the first meeting yesterday, which lasted about two hours, Pope Francis given the Chilean prelates a text to “pray and meditate” on, Crux reports. “This afternoon the Pope gave each of the bishops a text with some themes on which to meditate; from now on until the next meeting, a moment dedicated exclusively to meditation and prayer opens,” the Vatican said in a short statement.